Workplace bullying is more common and costly than most people realise. It can make life unbearable for employees in any industry and ultimately undermine an organisation's potential for profit. 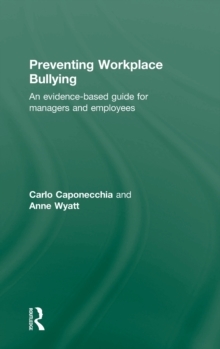 In this practical guide, Carlo Caponecchia and Anne Wyatt explain how to identify workplace bullying and apply best practice to preventing and managing it. Caponecchia and Wyatt outline what constitutes bullying at work, demystify some of the controversial issues, and discuss the various factors which influence workplace bullying. The responsibilities of management, and legal implications are outlined and supported with best practice guides for policies, complaints procedures and risk management systems. Options and resources for targets experiencing bullying are also explored. These ideas and concepts are illustrated throughout with real case studies. This evidence-based book on workplace bullying is a valuable resource for organizations of all sizes and for anyone affected by bullying at work including employees, human resource managers, workplace consultants, counsellors, mediators and legal advisors.